Our service recognizes the dignity of the person and enhances the quality of life for both older adults and those with special needs. TLC Companion Care (TLC) services allow seniors and families to maintain their independence as long as possible by providing in-home companionship and lifestyle assistance. Call us today to schedule your free in-home assessment! 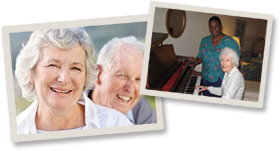 TLC Companion Care (TLC) services allow seniors and families to maintain their independence as long as possible by providing in-home companionship and lifestyle assistance. Our aim is to lift the spirits of both the senior, and family caregiver by providing the highest quality companion care service available. We are a local, family-owned company, which is operated, and staffed by residents in your community. We are also licensed (AHCA License # 231279), insured and bonded to better serve and protect our clients. Our commitment to caregiving grew out of a desire to assist the seniors in our neighborhoods and the realization that each is an individual with different needs. This attitude makes us more flexible and more personal in meeting your needs. We personally do all the assessments and match a companion that has been trained by us and whom we think will be a good fit for your specific needs. When we have selected the caregiver whom we think will be a good match for you or your loved one, we personally bring that caregiver to your home and introduce you. We want to ensure that the caregiver knows exactly what he/she is expected to do to assist you and that all questions regarding your care are answered. The main reason we like to be there with the caregiver when a new client starts with us is that we want to see if you and the caregiver will make a good connection that can grow into a trusting friendship. We will never send a new caregiver to your house without the TLC owner you met during your in-home assessment also being there. We work as a team to make sure that our clients are happy, healthy, well cared for and cared about.